This holiday, the Star Wars™: The Old Republic™ team is excited to announce a new Premium player (Subscriber) reward* – the new Twi’lek Pirate Companion, Paxton Rall! The most notorious pirate to rise to fame across the galaxy since the invasion of the Eternal Empire, Paxton Rall scours the stars in an endless hunt for adventure and profit, making him a formidable ally in your Alliance. To fight alongside Paxton, you must have Premium player (Subscriber) status on Friday, December 14, 2018 @ 11:59PM PST / Saturday, December 15, 2018 @ 7:59AM GMT. Paxton will be delivered via in-game mail by Thursday, December 20, 2018 @ 11:59AM PST / Friday, December 21, 2018 @ 7:59AM GMT. You can also encounter Paxton and learn more about him on the planet of Odessen after completing Chapter IX of the Knights of the Fallen Empire expansion. If you'd like to begin traveling with him immediately, you can use the token attached to your in-game mail to unlock Paxton as a Companion at any time. Using this item will not prevent you from playing through his recruitment mission! Enjoy access to a wide spectrum of character species in the game – Create the character that fits your personality best. 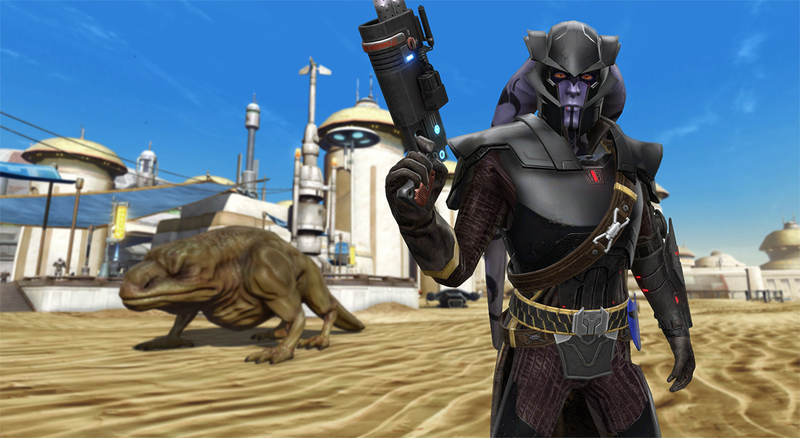 Get full access to PvP Warzones, Flashpoints, Uprisings and Operations at Level 70 through Galactic Command. Receive monthly Complimentary Cartel Coins to trade in for gear, XP Boosts, mounts and more in-game! All past expansions, including Rise of the Hutt Cartel, Shadow of Revan, Knights of the Fallen Empire and Knights of the Eternal Throne are included with your Premium service.